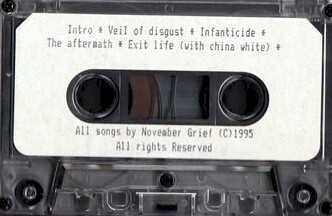 November Grief was a thrash / death metal band from Montreal, Canada. Initially called Mistrust, their creators were Annie Lecrerc on drums, and vocalist Stéphanie Masson, who took over the bass duties by failing to find anyone to fill the position. The search came up with guitarist Veronica Lambert, Vero, and the trio decided to rename themselves November Grief, according to them more in line with their style. A year later they released their first demo, recorded in the rehearsal room in a 16 tracks and called “Evil-ution”, with which they began sweeping through the stages of Quebec. The sound of November Grief got better with the addition of a second guitarist a year later, Chantal Levesque, who brought fresh ideas and a more forceful sound, as reflected in their second demo “To Live … In this world of Chaos”. But here they came the comings and goings of components, which led to the disappearance of November Grief. Veronica left the ship and entered Carole Roy, like Chantal. The remaining components, their two founders Annie and Stephanie, decided to form another group, Elixirs, later renamed Potion 13 with a more classical and even heavy rock, yet active without any of them in their lineup. Xerox cover with regular tapes.